NOMA GALLERY and curator Brooke Lynn McGowan presents "Yesterday, I told you the truth", New international responses to the photographic image, at MIAMI PROJECTS art fair December 4 to 9, 2012 in Miami. A letter to a Japanese lover; a father slumped, afloat on in the depth of a coloured jungle; white explosions in a darkened sky; a decisively painted landscape of black; a man fishing: all of this and none of the above. Between confession and testimony, evidence and affect, the history of photography presents a practice of representation steeped in an assumption of transparency; yet for the artists in this exhibition, carefully selected by NOMA Gallery San Francisco for the first annual Miami Projects, at the intervention of the textual or material, photography, within this trajectory, no longer speaks its own name, or at least not any name of the purported ‘truth’ it was meant to claim. Presenting instead a post-medium and post-conceptual aesthetic, in each case, for these artists, the referent is defunct or fallen away; its relationship to the ça a été of the photographic image interrupted by imprint, where the fond, base or ground of the image oscillates between gross materiality and net affect: in either case, we are not speaking of memory, at least not of a person or a place, or a what has been. There are no winter gardens here. Rather, for these photographers a new relationship to the image emerges in the form of an anxiety of index: the photograph as vestige, the ghost of a reference past. For British artist Justin Coombes, this new reaction/relation to the photographic image manifests in an exploration of between affect and image in their replicants of image and text. Composing profound poetic works in contrast to profoundly composed photographs, Coombes derides the statement that a picture is worth a thousand words, rather framing each fantastic tableau in the language they would otherwise consume, and hastening forth the formal quality of light in the photograph towards the surface of the photographically self-referential; produced however as sweepingly epic, yet compellingly personal landscape mis-en-scène. Taken from two bodies of work, Hokkaido Postcard, composed from work completed by the artist during a residency in Japan, and the more recent Halycon Song, reflective of his native London, Coombes images explore the depths of melancholia implied in the history of the photographic image, invested in a deep yearning, and yet with marked with the signs of an unmistakable irreverence—passion and nostalgie playing over a void. Neither completed by nor entirely separate from the poetic language and epistolary forms which accompany them, these photographs stand in intimate partnership with the texts sheltered under the same name. 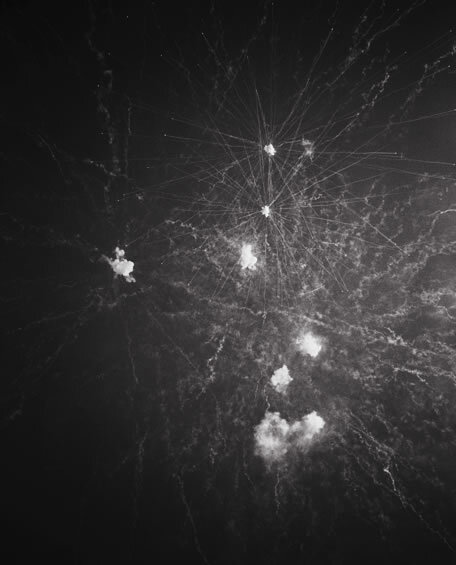 In opposition, the work of Kim Schoen, from her series A Series Catastrophes and Celebrations documenting a fireworks display in broad daylight in California’s Lucerne Valley near Los Angeles whilst challenging the conception that the photograph might document at all. Instead, what these elegant black and white images present is the nature of event and the rhetorically determined or motivated narration which decides whatever testimony such images might provide. Schoen’s images hollow out this relation in a nearly nihilist exposure of fallacy and rupture, where meaning if it is made, falls short, stubbles, collapses, explodes. ‘Inherent to the photographic,’ intones German American artist Esther Teichmann, is the paradox and impossibility of grasping a body, the quest to close the gap between oneself and the other, the image, and the inevitable distance which always remains.’ For Teichmann, critical discourses on the nature of the Other or other as the site of abhorrence, or abjection, the disuse jettisoned in the construction of the fortress of the self appears as not only as the weary rhetoric of the still colonized mind, but also a complete denial as to the thought and nature of love. In her series from Mythologies—composed of photography as much as appropriated imagery, in addition to painted tableau, arrived directly from exhibition at the Houston Center for Photography, and available commercially for the first time—displays an awareness of the outstanding fiction which is both the confession of the image, and the impassable distance, in terms of threshold, site, and territory between the body of oneself, and that of another. ‘I am fascinated,’ she says, ‘by what we can never know’ For Teichmann, unlike Schoen, the relation is not one to the ‘decisive moment’ and the photograph’s servitude to history, but is one about relationships, fantasy, family, affection, and the imaginal unconscious of the history of art itself, as transposed on the psyche of the viewer; Recalling the trespasses of Gauguin as much as the darkness in any heart, Teichmann retains that alea or complete outside which is a the skin of another’s body, where the long history of the family portrait and a history of painting converge upon a new horizon—ever honest and staged, domestic and exotic. Michael Cappabianca, in stunning displays of momento having forsaken the mori , examines the still life of things as they inform the necessary in relationship to the referent in photographic practice. His is an art of enframing, not only in the masterful understanding of composition, but in a visual rhetoric exploring the very conditions for an image to exist at all. For the Material series, this image is the conflation of the mental, imaginal, or fictive image and the forlorn, dumb materiality of the book—a medium itself slowly fading into cultural memory, and thus attaining a disuse which would render them art objects themselves. Additionally, in the newest series, for which Back/Drop/Ground #1-3 was created, his photographs present an occurrence in abeyance, or a moment of dereliction: presage or regret.. Closer to Robert Ryman than Robert Capa, Cappabianca produces of dilapidated theater warehouse, visiting, also like Teichmann, elements of fantasy and staging as inherent in the image making process in any medium, and suggesting an examination of the limits of medium and form. In Georgi Tushev’s engrossing elegant compositions, the skin of another becomes the skin of the work of art, investing in the power of magnets to produce that event that is the image, the artist reminds the view that it is the material which renders the abstract, the fiction of the image which produces any ‘truth’, and the abstract itself which is the referent. Tushev, born and raised in Bulgaria, evidences a new chapter in the continuing dialectic between the history of photography and that of oil, acrylic, mars black and titanium white. Tushev’s work reflects the trajectory of his desire to find ‘another method’ like photography of ‘capturing the invisible’. Exploring techniques similar to those employed in x-ray technology—notably magnetism, the artist’s work reflects the most radical reaction to the photographic: its abandon altogether.